The lesson of the day is this: It’s ok to set boundaries. In fact, it’s absolutely essential to your happiness. I haven’t written in awhile due to kids, bracelet business, and well just figuring life out in general. But mostly it’s because I’ve been really focused on myself lately. And I’ve been really happy because of it. My happiness is more important than my kids’ happiness. Because if I don’t tend to myself, I’ve got nothing to give them anyway. It’s why I don’t yell 24/7 and can generally be calm in the middle of the storm. I say generally because I lose it from time to time as my kids will attest! If you don’t set boundaries, you’re going to run out of steam. It’s why my kids don’t play hockey or do half of the stuff other kids are doing. Why you ask? Because I CHOOSE ME. I choose to give myself time while they fight with each other in the back yard. I let them fight and tell them to figure it out. I ignore their issues and trust them to learn some lessons. Did your brother punch you in the face? Well, that’s what happens when you punch someone in the back instead of walking away honey. Learn from it. I don’t ignore them completely. I’ve got eyes in the back of my head; I’m a mom. And when I’m not watching, I’m feeling it all. This is where it all comes together: Feel for your boundaries. Say someone invites you to a party and you don’t want to go. Tell them you can’t make it and don’t go. Listen to that gut feeling. Don’t go. Don’t make excuses. You don’t need to tell the truth per say, but you don’t need to lie either. Don’t do something to make someone else happy. Choose you and make yourself happy – there’s the secret to happy life! Appreciate everything, and do the stuff that makes you happy. Boom. Sometimes I do things I don’t want to do because it will make my kids happy, but I’m doing it for me too, because making them happy makes me happy. Taking them to the park when I want to lay on the couch makes all of us happy, so I go. My gut feeling here is not saying “lay on the couch”. It is saying “take them to the park”. So I go. When I was waitressing, my boss had another restaurant halfway across the city. He asked me to work at the other location a few times and I said “no.” The result? He stopped asking me. You know who he did ask repeatedly? The girls who said “yes” and complained to me on the side about having to go to the further location. “That’s why I said no!” I would tell them. 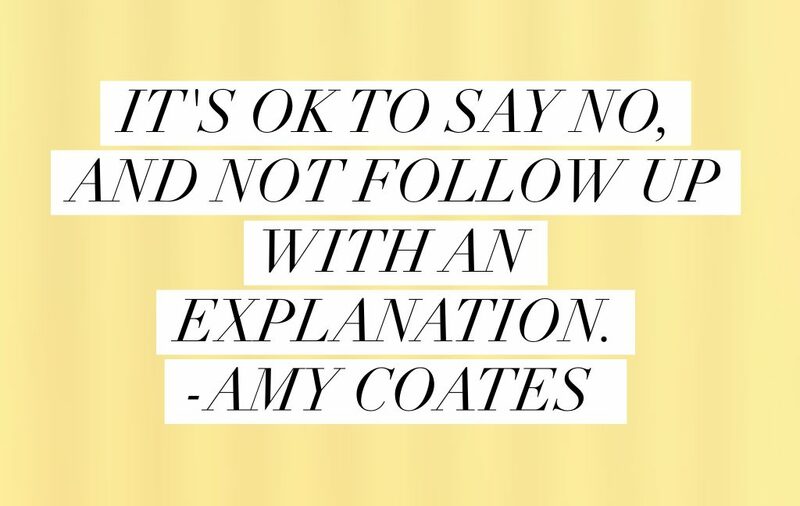 It’s ok to say no. And you don’t need to explain why either. It’s ok to not care what other people think of you. It’s ok to do it your way. You’re doing a great job. You’re exactly where you meant to be in this time and space. Every day is a gift. Every day you get to wake up and decide you are going to be true to yourself. Every day is a chance to be your Divine Self here on Earth. It’s what you intended. Before you go to bed, think about who you are. You can meditate sitting up for 15-20 minutes or you can lay in bed and just visualize your ideal self. Think of the boundaries you need to set, and decide what you are willing and not willing to tolerate. And when you wake up in the morning, wake up as this person you really are. If people are mean, let them be mean. If they lash out, let them lash out and follow your instincts. This can mean you rise above it and ignore it. Or it can mean that you explain your perspective. Just stay in alignment with your higher self and follow any guidance that comes. When you lash back, it means you give away your power. Know who you really are and let them rise up to meet you, or leave them where they are. Five people can witness the exact same event and have 5 different perspectives that don’t line up with each other in the least. 5 different “realities” of 1 so called “reality”. Know that they are where they are and stand in the knowing that they can be more. They will either meet you or stay put, and it’s all ok. The point is, people are human. News flash! Humans are weird. You can’t control them. But you can control you. You can control your thoughts, and you can control your reactions or, lack thereof. You can set boundaries, and they can like them or not. It doesn’t matter how they respond so long as you are true to yourself. Is your adult son living with you and treating you like garbage? Set a date and kick him out. It’s time for him to realize he can fly. Are you ready to say something that someone is not ready to hear? If you’re ready to say it, then say it. It doesn’t matter if they’re ready to hear it. You’re ready to say it. I’m not telling you to go attack people you’ve “had it up to here” with, but I am telling you to stop taking crap from people that you have been taking because you haven’t listened to your intuition. Stand up for yourself. Chance are, you have a nagging feeling right now about something that you know you need to do but are scared to do, and this is your sign to do it. There is nothing to fear. It’s in your head. There is nothing to worry about. Everything is always working out for you, and you’ve got to trust your feelings. When you know something, you know it. You don’t need to know why. Don’t take anything personally ever. Your parents did the best they could do given their growth and their perceived worth. It wasn’t about you or because of you, it was because of them. Everything everyone does is because of them. Don’t take it anything personally. Be yourself. Do what makes you happy. You are where you are, and that’s ok.